I defend State of Illinois agencies in civil actions. Currently, I practice exclusively in federal court, focusing on civil rights claims and claims brought under Title II of the Americans with Disability Act. 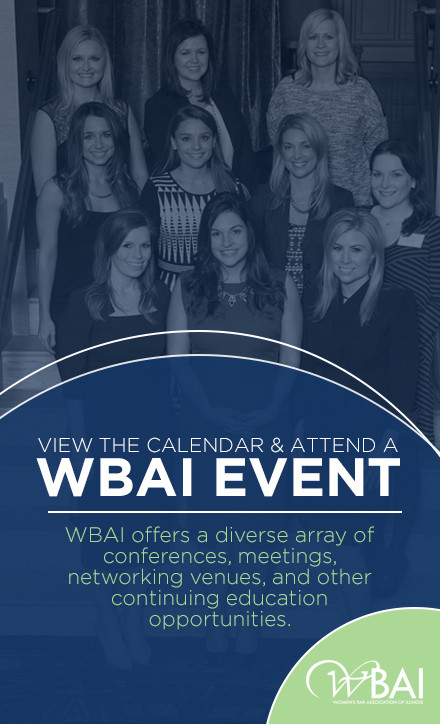 I joined the WBAI when I was in law school to meet more female attorneys and found a very welcoming and supportive professional community. Since then, my involvement with the WBAI has evolved along with my career and personal life. I have formed many friendships with the women I have met through the organization. Now, the WBAI is like an old friend; I couldn’t imagine my legal career without it. I most admire attorneys who are authentically themselves and know how to use that to their advantage. There is such pressure on women in the law to act in a particular way to get ahead. Whatever their personality type, I admire the female attorneys who despite that pressure, know themselves well and are confident in that. Seeing those kinds of examples has helped me build my own personal style and become more confident in my abilities. Professionally, I am most looking forward to being lead counsel in my first federal trial this spring. Personally, I am looking forward to watching my daughter start kindergarten and visiting my younger brother at college in Colorado this fall. Last year, I earned my black belt in Shotokan Karate. Karate is both a stress reliever and a way great way to sharpen my mind. The things I learn in my sparring matches, like confidence and humility, translate very well into my law practice.